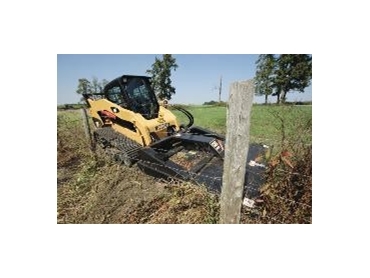 Caterpillar Brush cutters are used for clearing overgrowth, utility easements and for initial land clearing for housing, parks and recreational areas. Caterpillar offers five models of brush cutters. The BR160, BR166, and BR172 are performance matches to operate efficiently on Cat Skid Steer and Multi Terrain Loaders standard flow hydraulic system. The BR272 brush cutter is designed specifically for the high flow auxiliary hydraulic circuit and horsepower capabilities of the Caterpillar high flow machine models. The BR378 brush cutter is matched to the machine’s high flow (XPS) auxiliary hydraulic circuit to optimize work tool and machine performance. All models are matched for machine hydraulic system performance as well as machine horsepower and weight. High strength blades deliver high cutting action, durability and also mulch overgrowth. Fully balanced blade carriers prevent unnecessary vibration. Tapered blade carrier allows cutter to ride up over stumps and rocks. Long life motors deliver years of high-speed blade performance. Machined and heat treated gears in sealed gearbox provide reliable, durable transfer of torque from motor to blade carrier. The Brush cutters’ Motor protection guard shields motor and gear box from debris. Removing a set of bolts allows this hinged guard to be moved away for easy access to motor and gearbox. Caterpillar Skid Steer Loaders and Multi Terrain Loader Work Tools incorporate an interface that matches the machine's integrated mechanical and hydraulic quick coupler systems. Quick attach mounting allows the operator to quickly change from one high performance Cat Work Tool to another, increasing machine versatility. Caterpillar Brush cutters are available from Westrac .